The first use of the term "baritone" emerged as baritonans, late in the 15th century, usually in French sacred polyphonic music. At this early stage it was frequently used as the lowest of the voices (including the bass), but in 17th-century Italy the term was all-encompassing and used to describe the average male choral voice. Baritones took roughly the range as it is known today at the beginning of the 18th century, but they were still lumped in with their bass colleagues until well into the 19th century. Indeed, many operatic works of the 18th century have roles marked as bass that in reality are low baritone roles (or bass-baritone parts in modern parlance). Examples of this are to be found, for instance, in the operas and oratorios of George Frideric Handel. The greatest and most enduring parts for baritones in 18th-century operatic music were composed by Wolfgang Amadeus Mozart. They include Count Almaviva in The Marriage of Figaro, Guglielmo in Così fan tutte, Papageno in The Magic Flute and the lead in Don Giovanni. In theatrical documents, cast lists, and journalistic dispatches that from the beginning of the 19th century till the mid 1820s, the terms primo basso, basse chantante, and basse-taille were often used for men who would later be called baritones. These included the likes of Filippo Galli, Giovanni Inchindi, and Henri-Bernard Dabadie. The basse-taille and the proper bass were commonly confused because their roles were sometimes sung by singers of either actual voice part. the young Giuseppe Verdi (Nabucco, Ernani, Macbeth, Rigoletto, La traviata, Il trovatore). The prolific operas of these composers, plus the works of Verdi's maturity, such as Un ballo in maschera, La forza del destino, Don Carlos/Don Carlo, the revised Simon Boccanegra, Aida, Otello and Falstaff, blazed many new and rewarding performance pathways for baritones. Figaro in Il barbiere is often called the first true baritone role. However, Donizetti and Verdi in their vocal writing went on to emphasize the top fifth of the baritone voice, rather than its lower notes—thus generating a more brilliant sound. Further pathways opened up when the musically complex and physically demanding operas of Richard Wagner began to enter the mainstream repertory of the world's opera houses during the second half of the 19th century. Luckily, the gramophone was invented early enough to capture on disc the voices of the top Italian Verdi and Donizetti baritones of the last two decades of the 19th century, whose operatic performances were characterized by considerable re-creative freedom and a high degree of technical finish. They included Mattia Battistini (known as the "King of Baritones"), Giuseppe Kaschmann (born Josip Kašman) who, atypically, sang Wagner's Telramund and Amfortas not in Italian but in German, at the Bayreuth Festival in the 1890s; Giuseppe Campanari; Antonio Magini-Coletti; Mario Ancona (chosen to be the first Silvio in Pagliacci); and Antonio Scotti, who came to the Met from Europe in 1899 and remained on the roster of singers until 1933. Antonio Pini-Corsi was the standout Italian buffo baritone in the period between about 1880 and World War I, reveling in comic opera roles by Rossini, Donizetti and Paer, among others. In 1893, he created the part of Ford in Verdi's last opera, Falstaff. There are 19th-century references in the musical literature to certain baritone subtypes. These include the light and tenorish baryton-Martin, named after French singer Jean-Blaise Martin (1768/69–1837), and the deeper, more powerful Heldenbariton (today's bass-baritone) of Wagnerian opera. Perhaps the most accomplished Heldenbaritons of Wagner's day were August Kindermann, Franz Betz and Theodor Reichmann. 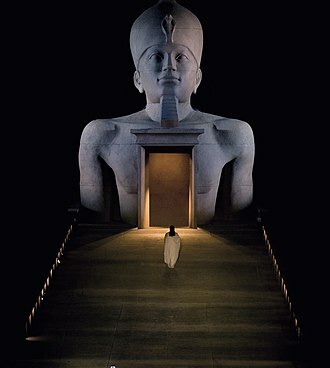 Betz created Hans Sachs in Die Meistersinger and undertook Wotan in the first Der Ring des Nibelungen cycle at Bayreuth, while Reichmann created Amfortas in Parsifal, also at Bayreuth. Lyric German baritones sang lighter Wagnerian roles such as Wolfram in Tannhäuser, Kurwenal in Tristan und Isolde or Telramund in Lohengrin. They made large strides, too, in the performance of art song and oratorio, with Franz Schubert favouring several baritones for his vocal music, in particular Johann Michael Vogl. Nineteenth-century operettas became the preserve of lightweight baritone voices. They were given comic parts in the tradition of the previous century's comic bass by Gilbert and Sullivan in many of their productions. This did not prevent the French master of operetta, Jacques Offenbach, from assigning the villain's role in The Tales of Hoffmann to a big-voiced baritone for the sake of dramatic effect. Other 19th-century French composers like Meyerbeer, Hector Berlioz, Camille Saint-Saëns, Georges Bizet and Jules Massenet wrote attractive parts for baritones, too. These included Nelusko in L'Africaine (Meyerbeer's last opera), Mephistopheles in La damnation de Faust (a role also sung by basses), the Priest of Dagon in Samson and Delilah, Escamillo in Carmen, Zurga in Les pêcheurs de perles, Lescaut in Manon, Athanael in Thaïs and Herod in Hérodiade. Russian composers included substantial baritone parts in their operas. Witness the title roles in Peter Tchaikovsky's Eugene Onegin (which received its first production in 1879) and Alexander Borodin's Prince Igor (1890). The dawn of the 20th century opened up more opportunities for baritones than ever before as a taste for strenuously exciting vocalism and lurid, "slice-of-life" operatic plots took hold in Italy and spread elsewhere. 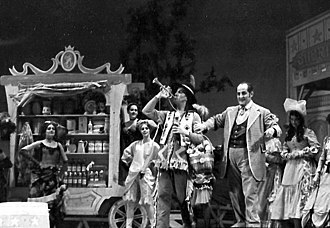 The most prominent verismo baritones included such major singers in Europe and America as the polished Giuseppe De Luca (the first Sharpless in Madama Butterfly), Mario Sammarco (the first Gerard in Andrea Chénier), Eugenio Giraldoni (the first Scarpia in Tosca), Pasquale Amato (the first Rance in La fanciulla del West), Riccardo Stracciari (noted for his richly attractive timbre) and Domenico Viglione Borghese, whose voice was exceeded in size only by that of the lion-voiced Titta Ruffo. Ruffo was the most commanding Italian baritone of his era or, arguably, any other era. He was at his prime from the early 1900s to the early 1920s and enjoyed success in Italy, England and America (in Chicago and later at the Met). Characteristic of the Wagnerian baritones of the 20th century was a general progression of individual singers from higher-lying baritone parts to lower-pitched ones. This was the case with Germany's Hans Hotter. Hotter made his debut in 1929. As a young singer he appeared in Verdi and created the Commandant in Richard Strauss's Friedenstag and Olivier in Capriccio. By the 1950s, however, he was being hailed as the top Wagnerian bass-baritone in the world. His Wotan was especially praised by critics for its musicianship. Other major Wagnerian baritones have included Hotter's predecessors Leopold Demuth, Anton van Rooy, Hermann Weil, Clarence Whitehill, Friedrich Schorr, Rudolf Bockelmann and Hans Hermann Nissen. Demuth, van Rooy, Weil and Whitehill were at their peak in the late 19th and early 20th centuries while Schorr, Bockelmann and Nissen were stars of the 1920s and 1930s. In addition to their heavyweight Wagnerian cousins, there was a plethora of baritones with more lyrical voices active in Germany and Austria during the period between the outbreak of WW1 in 1914 and the end of WW2 in 1945. Among them were Joseph Schwarz [de], Heinrich Schlusnus, Herbert Janssen, Willi Domgraf-Fassbaender, Karl Schmitt-Walter and Gerhard Hüsch. Their abundant inter-war Italian counterparts included, among others, Carlo Galeffi, Giuseppe Danise, Enrico Molinari, Umberto Urbano, Cesare Formichi, Luigi Montesanto, Apollo Granforte, Benvenuto Franci, Renato Zanelli (who switched to tenor roles in 1924), Mario Basiola, Giovanni Inghilleri, Carlo Morelli (the Chilean-born younger brother of Renato Zanelli) and Carlo Tagliabue, who retired as late as 1958. Gobbi's competitors included Gino Bechi, Giuseppe Valdengo, Paolo Silveri, Giuseppe Taddei, Ettore Bastianini, Cesare Bardelli and Giangiacomo Guelfi. Another of Gobbi's contemporaries was the Welshman Geraint Evans, who famously sang Falstaff at Glyndebourne and created the roles of Mr. Flint and Mountjoy in works by Benjamin Britten. Some considered his best role to have been Wozzeck. The next significant Welsh baritone was Bryn Terfel. He made his premiere at Glyndebourne in 1990 and went on to build an international career as Falstaff and, more generally, in the operas of Mozart and Wagner. Among the late-20th-century baritones noted throughout the opera world for their Verdi performances was Vladimir Chernov, who emerged from the former USSR to sing at the Met. Chernov followed in the footsteps of such richly endowed East European baritones as Ippolit Pryanishnikov (a favorite of Tchaikovski's), Joachim Tartakov (an Everardi pupil), Oskar Kamionsky (an exceptional bel canto singer nicknamed the "Russian Battistini"), Waclaw Brzezinski (known as the "Polish Battistini"), Georges Baklanoff (a powerful singing actor), and, during a career lasting from 1935 to 1966, the Bolshoi's Pavel Lisitsian. Dmitri Hvorostovsky and Sergei Leiferkus are two Russian baritones of the modern era who appear regularly in the West. Like Lisitsian, they sing Verdi and the works of their native composers, including Tchaikovsky's Eugene Onegin and The Queen of Spades. Prior to World War II, Germany's Heinrich Schlusnus, Gerhard Hüsch and Herbert Janssen were celebrated for their beautifully sung lieder recitals as well as for their mellifluous operatic performances in Verdi, Mozart, and Wagner respectively. After the war's conclusion, Hermann Prey and Dietrich Fischer-Dieskau appeared on the scene to take their place. In addition to his interpretations of lieder and the works of Mozart, Prey sang in Strauss operas and tackled lighter Wagner roles such as Wolfram or Beckmesser. Fischer-Dieskau sang parts in 'fringe' operas by the likes of Ferruccio Busoni and Paul Hindemith as well as appearing in standard works by Verdi and Wagner. He earned his principal renown, however, as a lieder singer. Talented German and Austrian lieder singers of a younger generation include Olaf Bär, Matthias Goerne, Wolfgang Holzmair (who also performs regularly in opera), Thomas Quasthoff, Stephan Genz [de] and Christian Gerhaher. Well-known non-Germanic baritones of recent times have included the Italians Giorgio Zancanaro and Leo Nucci, the Frenchman François le Roux, the Canadians Gerald Finley and James Westman and the versatile American Thomas Hampson, his compatriot Nathan Gunn and the Englishman Simon Keenlyside. Baritone voice range (A2–A4) notated on the bass staff (left) and on the piano keyboard in green with dot marking middle C (C4). The vocal range of the baritone lies between the bass and the tenor voice types. The baritone vocal range is usually between the second A below middle C (A2) and the A above middle C (A4). The baryton-Martin baritone (sometimes referred to as light baritone) lacks the lower G2–B2 range a heavier baritone is capable of, and has a lighter, almost tenor-like quality. Its common range is from C3 to the B above middle C (C3 to B4). Generally seen only in French repertoire, this Fach was named after the French singer Jean-Blaise Martin. 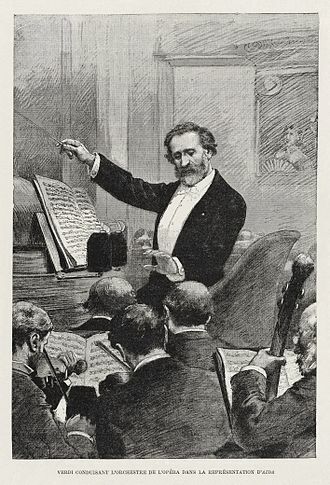 Associated with the rise of the baritone in the 19th century, Martin was well known for his fondness for falsetto singing, and the designation 'baryton Martin' has been used (Faure, 1886) to separate his voice from the 'Verdi Baritone', which carried the chest register further into the upper range. It is important to note that this voice type shares the primo passaggio and secondo passaggio with the Dramatic Tenor and Heldentenor (C4 and F4 respectively), and hence could be trained as a tenor. The baryton-noble baritone is French for "noble baritone" and describes a part that requires a noble bearing, smooth vocalisation and forceful declamation, all in perfect balance. This category originated in the Paris Opera, but it greatly influenced Verdi (Don Carlo in Ernani and La forza del destino; Count Luna in Il trovatore; Simon Boccanegra) and Wagner as well (Wotan; Amfortas). Similar to the Kavalierbariton. Bass-baritones are typically divided into two separate categories: lyric bass-baritone and dramatic bass-baritone. The dramatic bass-baritone is a lower baritone (a heldenbaritone). Its common range is from about the F below low C to the F♯ above middle C (F2 to F♯4). In bluegrass music, the melody line is called the lead. Tenor is sung an interval of a third above the lead. Baritone is the fifth of the scale that has the lead as a tonic, and may be sung below the lead, or even above the lead (and the tenor), in which case it is called "high baritone". Conversely, the more "soul" baritones have the more traditional timbre, but sing in a vocal range that is closer to the tenor vocal range. Some of these singers include Tom Jones Michael McDonald, and Levi Stubbs of the Four Tops. ^ Or barytone, although this spelling is essentially archaic and little-used since the 1920s. ^ Owen Jander, J. B. Steane, Elizabeth Forbes, Ellen T. Harris, and Gerald Waldman, 'Baritone (i)', in Stanley Sadie and John Tyrrell (eds. ), The New Grove Dictionary of Music and Musicians, 2nd edition, Macmillan, 2001. ISBN 0-333-60800-3. This work is the main reference for the history section of this article. ^ Larousse, Pierre (1865). Grand dictionnaire universel du XIXe siècle: Français, historique, géographique, mythologique, bibliographique, littéraire, artistique, scientifique, etc., etc. Bavarian State Library: Larousse & Boyer. p. 289. ^ * Laura Macy, Ed. The Grove Book of Opera Singers, Harold Rosenthal/Julian Budden, entry "Coletti, Filippo"
^ Moss, Charles K. "Franz Peter Schubert: Master of Song". Archived from the original on February 8, 2008. Retrieved July 13, 2010. ^ Stephen Thomas Erlewine, "Jones, Tom", Popular Artist Biographies, All Media Guide. ^ Stephen Thomas Erlewine, "Biography: Michael McDonald", All Media Guide. ^ Stars mourn Four Tops star Stubbs, BBC News, 28 October 2008. Wikisource has the text of the 1911 Encyclopædia Britannica article Barytone. Rigoletto is an opera in three acts by Giuseppe Verdi. The Italian libretto was written by Francesco Maria Piave based on the play Le roi samuse by Victor Hugo. Despite serious initial problems with the Austrian censors who had control over northern Italian theatres at the time and it is considered by many to be the first of the operatic masterpieces of Verdis middle-to-late career. Its tragic story revolves around the licentious Duke of Mantua, his court jester Rigoletto. The operas original title, La maledizione, refers to the placed on both the Duke and Rigoletto by a courtier whose daughter had been seduced by the Duke with Rigolettos encouragement. The curse comes to fruition when Gilda likewise falls in love with the Duke, Verdi was commissioned to write a new opera by the La Fenice opera house in Venice in 1850. By this time he was already a composer and had a degree of freedom in choosing the works he would prefer to set to music. He asked Francesco Maria Piave to examine the play Kean by Alexandre Dumas, père, Verdi soon stumbled upon Victor Hugos five-act play Le roi samuse. He explained that The subject is grand and there is a character that is one of the greatest creations that the theatre can boast of, in any country and in all history. It was a controversial subject, and Hugo himself had already had trouble with censorship in France. As Austria at that time controlled much of Northern Italy. Hugos play depicted a king as an immoral and cynical womanizer, from the beginning, Verdi was aware of the risks, as was Piave. 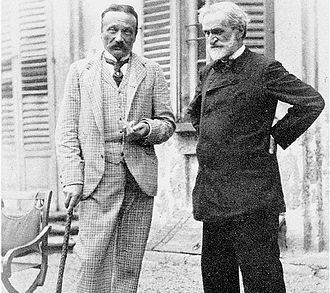 In a letter which Verdi wrote to Piave, Use four legs, run through the town, correspondence between a prudent Piave and an already committed Verdi followed, but the two underestimated the power and the intentions of Austrians and remained at risk. Even the friendly Guglielmo Brenna, secretary of La Fenice, who had promised them that they would not have problems with the censors, was wrong, at the beginning of the summer of 1850, rumours started to spread that Austrian censorship was going to forbid the production. The censors considered the Hugo work to verge on lèse majesté, in August and Piave prudently retired to Busseto, Verdis hometown, to continue the composition and prepare a defensive scheme. I puritani is an opera in by Vincenzo Bellini. It was originally written in two acts and changed to three acts on the advice of Gioachino Rossini, with whom the composer had become friends. Taking from April until its premiere the following January, Bellini had time to ensure that the opera was as close to perfection as possible. In a word, my dear Florimo, it was an unheard of thing, upon his arrival in Paris, Bellini quickly entered into the fashionable world of the Parisian salons, including that run by Princess Belgiojoso whom he had met in Milan. In addition to the writers of the time, among the musical figures which he would have encountered were several Italians such as Michele Carafa and Luigi Cherubini. Thus, for most of the remainder of 1833, Bellinis musical activity was very limited and he pleaded guilty in the letter to Florimo in March 1834 noting that the citys attractions were immense. The contract to write a new opera for the Théâtre-Italien, which was signed in January 1834, in the same letter he tells of working towards finding a subject with the Italian émigré, Count Pepoli, who had not written a libretto before. The chosen source of the libretto was identified as a play performed in Paris only six months before in September 1833. When first shown the play and other subjects by Pepoli, in the opinion of writer William Weaver, it was clearly the heroines madness that attracted the composer. But a month later, he comments to Florimo on what it takes working on the libretto with Pepoli, keeping moving ahead costs me a lot of weariness, he lacks practice which is a great thing. Finally, Bellini stated that he did not want to negotiate with anybody until I see what success my opera will have and this included a proposal from the Opéra-Comique in Paris for a new opera for that company. Pepoli adopts a modern aesthetic agenda, condemning vocal ornamentation as a dilution of dramatic sense and attacking imitation as cheapening musics inherent, quoting Pepoli, Smart continues, for this song the people ﬁght, triumph and the world shouted Liberty. It is beautiful to face death shouting liberty, she recounts how Bellini reacted to what she describes as Pepoli’s “hotheaded patriotism which appears in librettist’s poetry. Giacomo Meyerbeer was a German opera composer of Jewish birth who has been described as perhaps the most successful stage composer of the nineteenth century. With his 1831 opera Robert le diable and its successors, he gave the genre of grand opera decisive character, Meyerbeers grand opera style was achieved by his merging of German orchestra style with Italian vocal tradition. These were employed in the context of sensational and melodramatic libretti created by Eugène Scribe and were enhanced by the up-to-date theatre technology of the Paris Opéra and they set a standard which helped to maintain Paris as the opera capital of the nineteenth century. Born to a very wealthy Berlin family, Meyerbeer began his career as a pianist but soon decided to devote himself to opera. His 1824 opera Il crociato in Egitto was the first to bring him Europe-wide reputation and he was at his peak with his operas Les Huguenots and Le prophète, his last opera was performed posthumously. His operas made him the most frequently performed composer at the leading opera houses in the nineteenth century. He was a supporter of Richard Wagner, enabling the first production of the latters opera. He was commissioned to write the patriotic opera Ein Feldlager in Schlesien to celebrate the reopening of the Berlin Royal Opera House in 1844, apart from around 50 songs, Meyerbeer wrote little except for the stage. Meyerbeers works are infrequently performed today. Meyerbeers birthname was Jacob Liebmann Beer, he was born in Tasdorf, near Berlin, the capital of Prussia, to a Jewish family. His father was the wealthy financier Judah Herz Beer and his mother, Amalia Wulff, to whom he was particularly devoted. Their other children included the astronomer Wilhelm Beer and the poet Michael Beer and he was to adopt the surname Meyerbeer on the death of his grandfather Liebmann Meyer Wulff and the first name Giacomo during his period of study in Italy, around 1817. Judah Beer was a leader of the Berlin Jewish community and maintained a synagogue in his house which leaned towards reformist views. Jacob Beer wrote a cantata for performance at this synagogue. The Magic Flute, K.620, is an opera in two acts by Wolfgang Amadeus Mozart to a German libretto by Emanuel Schikaneder. The work is in the form of a Singspiel, a form that included both singing and spoken dialogue. 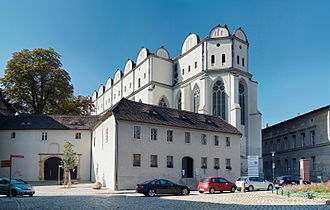 The work premiered on 30 September 1791 at Schikaneders theatre, the Freihaus-Theater auf der Wieden in Vienna, together and Pamina undergo severe trials of initiation, which end in triumph, with the Queen and her cohorts vanquished. The earthy Papageno, who accompanies Tamino on his quest, fails the trials completely but is rewarded anyway with the hand of his female companion Papagena. The opera was the culmination of a period of increasing involvement by Mozart with Schikaneders theatrical troupe, Mozart was a close friend of one of the singer-composers of the troupe, tenor Benedikt Schack, and had contributed to the compositions of the troupe, which were often collaboratively written. Mozarts participation increased with his contributions to the 1790 collaborative opera Der Stein der Weisen, like The Magic Flute, Der Stein der Weisen was a fairy-tale opera and can be considered a kind of precursor, it employed much the same cast in similar roles. The libretto for The Magic Flute, written by Schikaneder, is thought by scholars to be based on many sources, especially for the role of Papageno, the libretto draws on the Hanswurst tradition of the Viennese popular theatre. Many scholars acknowledge an influence of Freemasonry, for detailed discussion of sources see Branscombe, as well as Libretto of The Magic Flute. 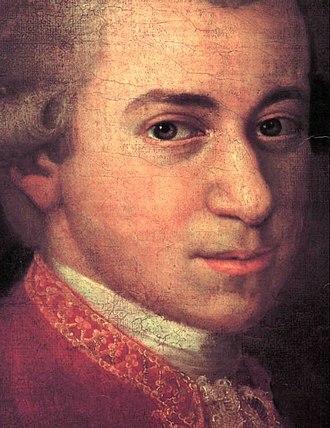 In composing the opera, Mozart evidently kept in mind the skills of the intended for the premiere. Thus, the lines for Papageno—sung by Schikaneder himself—and Monostatos are often stated first in the strings so the singer can find his pitch. In contrast, Mozarts sister-in-law Josepha Hofer, who premiered the role of the Queen of the Night, evidently needed little such help, in ensembles, Mozart skillfully combined voices of different ability levels. The vocal ranges of two of the singers for whom Mozart tailored his music have posed challenges for many singers who have since recreated their roles. Both arias of the Queen of the Night, O zittre nicht, mein lieber Sohn and Der Hölle Rache kocht in meinem Herzen require high F6, rare in opera. Il trovatore is an opera in four acts by Giuseppe Verdi to an Italian libretto largely written by Salvadore Cammarano, based on the play El trovador by Antonio García Gutiérrez. The premiere took place at the Teatro Apollo in Rome on 19 January 1853, where it began a victorious march throughout the operatic world and it began with his January 1850 approach to Cammarano with the idea of Il trovatore. These revisions are seen largely in the expansion of the role of Leonora, Then, in May 1851, an additional commission was offered by the Venice company after Rigolettos success there. Then another came from Paris while he was visiting that city from late 1851, today, in its Italian version, Trovatore is given very frequently and is a staple of the standard operatic repertoire. When considering setting Gutiérrezs play, Verdi turned to work with Cammarano and their correspondence began as early as January 1850, well before Verdi had done anything to develop a libretto with Piave for what became Rigoletto in Venice. At this time, it was the first since Oberto that the composer was beginning to prepare an opera with a librettist, in his first letter to Cammarano, Verdi proposed El Trovador as the subject with two feminine roles. The first, the gypsy, a woman of character after whom I want to name the opera. Relationship with Cammarano Verdis time and energy were spent mostly on finishing Rigoletto, within a matter of weeks, Verdi was expressing his frustration to a mutual friend, de Sanctis, at having no communication from Cammarano. These included Leonora taking the veil and the importance of the Azucena/Manrico relationship and he continued by asking whether the librettist liked the drama and emphasized that the more unusual and bizarre the better. Verdi plainly states that if there were no standard forms – cavatinas, trios, finales, etc. and if you could avoid beginning with an opening chorus. Correspondence continued between the two men for the two months or so, including another letter from the composer of 9 April which included three pages of suggestions. But he made concessions and expresses his happiness in what he is receiving in the way of verse, during the period to follow, in spite of his preoccupations but especially after he had begun to overcome them, Verdi had kept in touch with the librettist. In a letter around the time of his departure for France, he wrote encouragingly to Cammarano. Preoccupations and delays in 1851–1852 There arose the question of where the opera would eventually be presented, Verdi had turned down an offer from Naples, but became concerned about the availability of his preferred Azucena, Rita Gabussi-De Bassini. She turned out not to be on the Naples roster, including work on Trovatore, other projects consumed him, but a significant event occurred in February, when the couple attended a performance of Alexander Dumas filss The Lady of the Camellias. The couple returned to SantAgata by mid-March 1852 and Verdi immediately began work on Trovatore after a years delay. Death of Cammarano and work with Bardare Then, in July 1852, by way of an announcement in a theatrical journal and this was both a professional and a personal blow. 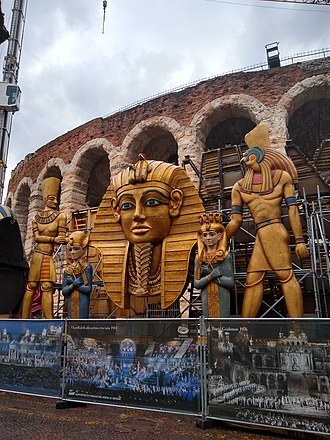 The opera is usually performed in Italian. The operas story is based on conflicts in the life of Carlos and it was commissioned and produced by the Théâtre Impérial de lOpéra and given its premiere at the Salle Le Peletier on 11 March 1867. When performed in one of its several Italian versions, the opera is generally called Don Carlo, the first Italian version given in Italy was in Bologna in March 1867. Revised again by Verdi, it was given in Naples in November/December 1872, two other versions were prepared, the first was seen in Milan in January 1884. That is now known as the Milan version, while the second—also sanctioned by the composer—became the Modena version and was presented in city in December 1886. It restored the Fontainebleau first act to the Milan four-act version, over the following twenty years and additions were made to the opera, resulting in a number of versions being available to directors and conductors. No other Verdi opera exists in so many versions, at its full length, it contains close to four hours of music and is Verdis longest opera. Pre-première cuts and first published edition Verdi made a number of cuts in 1866, after finishing the opera but before composing the ballet, simply because the work was becoming too long. After the ballet had been composed, it emerged during the 1867 rehearsal period that, without further cuts, the opera, as first published at the time of the première, consisted of Verdis original conception, minus all of the above-named cuts, but including the ballet. After the première and before leaving Paris, Verdi authorised the Opéra authorities to end Act 4, after his departure, further cuts were apparently made during the remaining performances. It was common practice at the time for most theatres to perform operas in Italian, and an Italian translation of Don Carlos was prepared in the autumn of 1866 by Achille de Lauzières. 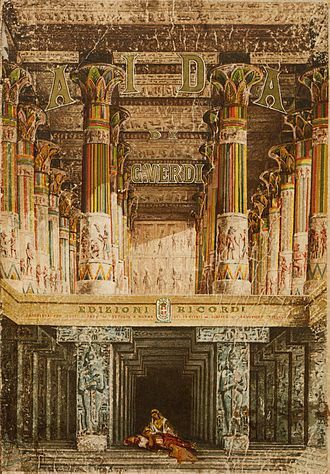 However, the Italian translation was first performed not in Italy but in London at the Royal Opera House, Covent Garden on 4 June 1867, where it was produced and conducted by Michael Costa. Additionally, the duet between Philip and the Inquisitor was shortened by four lines, and Elisabeths aria in Act 5 consisted only of part of the middle section, the production was initially considered a success, and Verdi sent a congratulatory note to Costa. Later when he learned of the alterations, Verdi was greatly irritated, for the Rome premiere on 9 February 1868 at the Teatro Apollo, perhaps unsurprisingly, the Papal censor changed the Inquisitor into a Gran Cancelliere and the Monk/Emperor into a Solitario. This version of the opera was first performed in Milan at La Scala on 25 March 1868, and prestige productions in most other Italian opera houses followed, the length was a particular problem, and subsequent performances were generally heavily cut. The first production in Naples in 1871 was indisputably a failure, following the unsuccessful performance in Naples in 1871, Verdi was persuaded to visit the city for further performances in November / December 1872, and he made two more modifications to the score. Norma is a tragedia lirica or opera in two acts by Vincenzo Bellini with libretto by Felice Romani after Norma, ou Linfanticide by Alexandre Soumet. It was first produced at La Scala in Milan on 26 December 1831, the opera is regarded as a leading example of the bel canto genre, and the soprano prayer Casta diva in Act I is justly famous. Crivelli and Company were managing both La Scala and La Fenice in Venice, and as a result, in April–May 1830 Bellini was able to negotiate a contract with them for two operas, one at each theatre. The opera for December 1831 at La Scala became Norma and while the one for the 1832 Carnival season at La Fenice became Beatrice di Tenda and Romani began to consider the subject of the coming autumns opera. By the summer, they had decided to base it upon Alexandre Soumets play which was being performed in Paris at around that time and they would fill the roles of Adalgisa and Pollione. 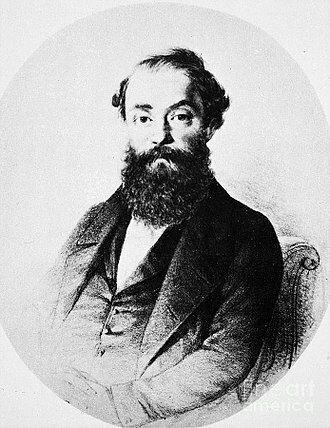 Donzelli provided Bellini with precise details of his capabilities which were confirmed by a report which the Neapolitan composer Saverio Mercadante provided. He reported in a letter to Pasta on 1 September, I hope that you find this subject to your liking. Romani believes it to be effective, and precisely because of the all-inclusive character for you. He will manipulate the situations so that they will not resemble other subjects at all, and he will retouch, even change, Norma was completed by about the end of November. While, for Romani, it became the most beautiful rose in the garland of all his work with Bellini, now at the height of his powers, was very demanding of his librettist and required many re-writes before he was satisfied enough to set it to music. After rehearsals began on 5 December, Pasta balked at singing the Casta diva in act 1, now one of the most famous arias of the nineteenth century. She felt that it was ill adapted to her vocal abilities, at the opening night, the opera was received with what Weinstock describes as chill indifference. To Florimo on the night of the premiere, Bellini wrote Fiasco, solemn fiasco. and proceeded to tell him of the indifference of the audience and how it affected him. Act 1: Cherubino hides behind Susanna's chair as the Count arrives. "Dr. Dulcamara" (Andrew Foldi), an itinerant quack and purveyor of "elixirs" and other tonics, gestures to "Cochise" (Bruce Cooper), his sly trumpet playing assistant, to call together the townspeople as he sings his act 1 (scene 2) aria "Udite, udite, o rustici" (Hear me, hear me, o peasants) in a performance of the Cincinnati Opera's noted 1968 "Wild West" production of L'elisir d'amore, in which the 1832 opera's setting was moved from a village in the Basque country to 1870s Texas.